Live Blood Analysis is a method used to view the current state and quality of your blood. A single living drop of your blood, taken from the tip of your finger, is put under a microscope and magnified 1000 times or more. This brings you a real visual of your blood’s behaviour. This is a different method to “staining blood” used in medical laboratories, that search for diseases, as they stain it with chemicals which kill it, therefore lots can be missed under the microscope from the blood’s behaviour. I do not use Live Blood Analysis for diseases themselves, or as a diagnostic tool, but to see any changes within your blood ecosystem relating to the digestive system health, and especially due to stress activity. This is a great tool to use when going through a Detox program, as to witness the difference of toxicity before and after a course of colonics and enema treatments. I will introduce you to Dr. D'Adamo's method as the right foods to eat according to your blood type. I used this method myself when I was diagnosed with Irritable Bowel Syndrome, to find out what was causing my gut's discomfort, and it helped me greatly. It is a very basic starting point and an easy way to learn about your own body and how to improve your health. Live Blood Microscopy can be a real life changing experience. It certainly was for me. It somehow illuminates some areas of our health that we didn’t quite know about. It provides a key to understanding ourselves better, and even offers a glimpse into our future health. It really has a strong influence in altering awareness, and therefore helps us moving toward the right direction when it comes to our health. Live Blood Analysis can amplify curiosity about your health, and quite easily increase your determination in making changes necessary to better yourself. Is it worth knowing, that all our blood cells are manufactured within our red bone marrow, and that also, there is a gradual replacement cycle of red to yellow marrow throughout our life, within our red bone marrow. Once we reached our adulthood, our blood cell production is then limited to flat bones, irregular bones and at the ends of long bones. The main sites being the sternum (breastbone), ribs, pelvis and skull. Red blood cells require both Vitamin B12 and folic acid for their production. Vitamin B12 is the hardest vitamin to absorb, as it has to have its own private “taxi-driver”, (intrinsic factor) picking it up from the stomach, and bringing it to its site of absorption, the small intestine (precisely in the terminal ileum). Without binding onto this carrier, absorption will not take place. mackerel, sardines, salmon, oysters, herring, meat and liver. Red blood cells have a fairly constant turnover, as the bone marrow produces them at the rate at which they are destroyed. If overproduction of red blood cells occur, it is likely to be because there is either excessive red blood cells breakdown (due to disease), heavy blood loss (haemorrhage), or you find yourself in high altitude with low oxygen supply. The red blood cell shape is extremely purposeful. They look like doughnut shaped cells. This biconcavity form increases their surface area for gas exchange, while its central thinness allows a faster flow between the entry and exit of those gases. Red blood cells life span is approximately 120 days. Some immature cells can be seen in Live Blood Microscopy, as they are still forming over a day or two within the circulation. This is a normal process of red blood cell production, although too many immature cells noticed under the microscope could show a Vitamin B12 and folic acid deficiency. You might show fatigue as an example, but also a vitamin and nutrient malabsorption in general, leading you to other health issues. Live Blood Analysis is a great visual on why certain white blood cells shouldn’t be there, unless you are going through these conditions. It brings you a better understanding of why you are feeling a certain way too, which is quite amazing really! Just think of your blood being purely a reflection of the stress you are experimenting at that precise moment, let it be physical or emotional, your immune system (white blood cells) will definitely show it. All the different types of white blood cells have a precise role to play within our body, even if they account for about 1% of the blood volume. Let me give you an insight on each of those amazing little guys. I think it’s important that you have some kind of understanding about it all before you come and see me. You should enjoy the consultation, and ask questions when you see certain cells you might recognise. It’s about your blood yes, but it is mostly about the experience! These white blood cells are the “protectors” of them all. They do not let anything harmful, entering our body and especially microbes! They will also remove some waste materials hanging around. 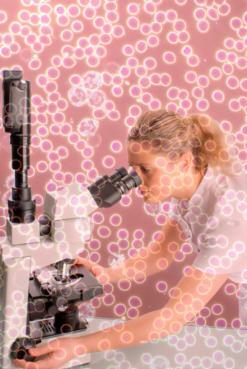 You will see them under the microscope in a big number when infection occur, as neutrophils are attracted to a chemical substance released by damaged and stressed cells. Eosinophils are more specialised toward parasites elimination such as worms. They are equipped with powerful toxic chemicals in order to attack those bigger organisms. They are also seen under the microscope if you are prone to allergic reaction such as asthma or skin allergies. Basophils are the white blood cells closely associated with allergic reactions, such as pollen allergy in hayfever, and you would see them under the microscope, if you were going through this type of condition. 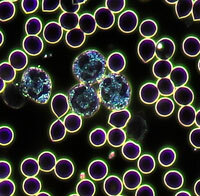 Other monocytes are fixed, and multiply at a site where they detect a large amount of foreign or waste materials. Their behaviour reminds me of a police forces using the “kettling technique”, as they “wall off” the area in order to control any sort of spreading from an infection or inflammation. Then they can release an array of chemicals onto them. All very fascinating! If you would like to learn about your blood, and see how it behaves under the microscope, make an appointment soon to come and enjoy the experience. Monday to Saturday, I will be happy to answer any enquiries you might have. Therapies offered at 4 Balance and Health are not substitutes for traditional medical care by your GP, they are complementary therapies that may be used in conjunction with conventional medicine. Should you be aware of any reasons why these therapies are contra-indicated to you or you have a serious health problem, please consult your GP prior to their use. Copyright © 2019 - Edwige Cabanetos - No part of this Website may be reproduced without prior permission from the owner - All photographs belong to 4 Balance and Health, and no photographs may be taken without 4 Balance and Health permission - All rights reserved.